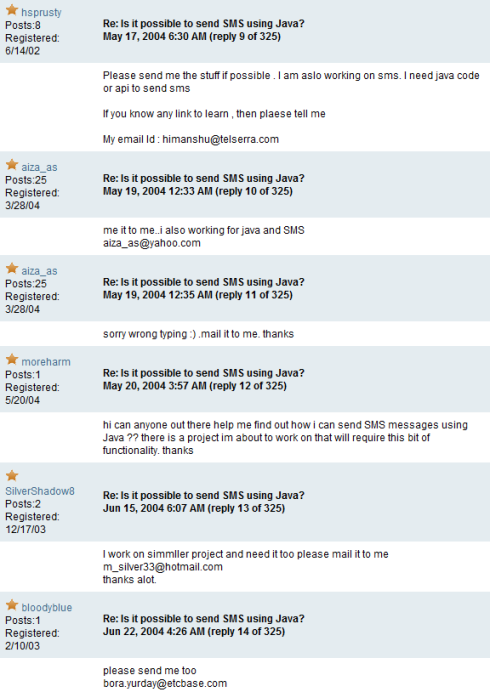 Back in July of 2001, a member of Sun's EmbeddedJava Forums asked a fairly simple question: Is it possible to send SMS using Java? See the thread, and all of twenty two pages of replies here. This was originally posted in the the Sidebar on 2007-11-28. 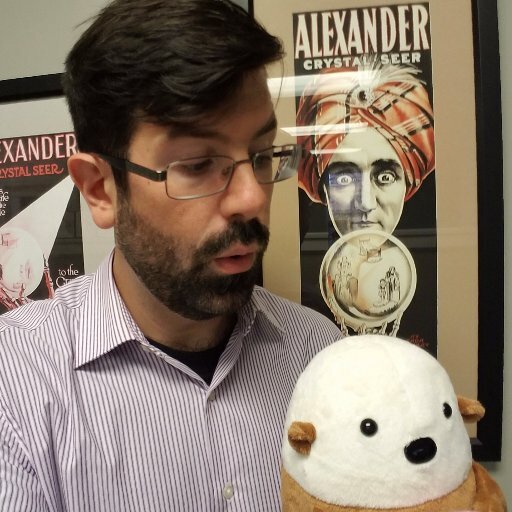 Post 1 I am a student/highly paid developer(where? where? 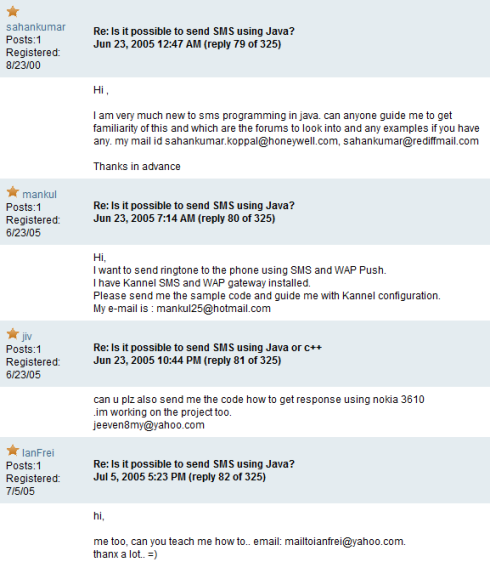 )/lowly code monkey somewhere working on an exam/certification/job application and I need the code to support the answer and the answer. Please gurus bail me out! Post 2 A polite request they post the code they have so far. Post 3-300+ Slash bash thump bang! Why should I do YOUR work! Plus various ugly comments on the poster's ethic, ethnicity, out sourcing and certification. And replys by all the bashers to eachother (Ok, it's easy to get into bashing, it gets so old after awhile). post 300x Nasty reply by original poster saying (s)he didn't need their crappy help anyway and was only trying to prove that (various comments on ethnicity of replies) can't code anyway and see NOBODY POSTED CODEZ so it PROVES they can't code. 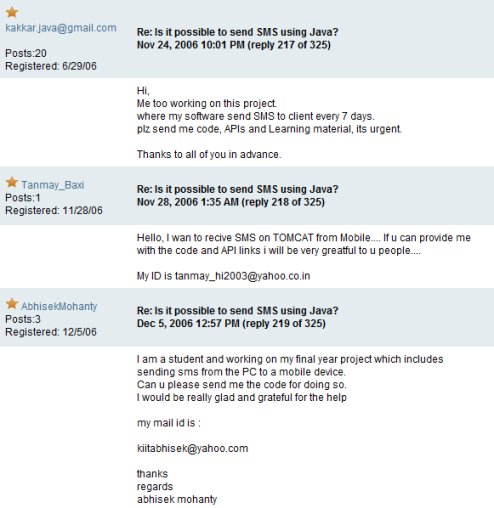 post 300x+ - 400 Rants about how the replying poster is not going to be duped into providing code by such a simple ploy. post 400+ Taunts from the original poster, who has not figured out that they aren't getting code. This I just don't understand. It's not like you can just drop "teh codez" jar in and BadaBoom BadaBing it works. There will not be any documentation, so teh codez will have to be read and understood. Anyone who can do that does not need teh codez, as they can RTG and RTM. Note to all the India and China bashers: about 75 percent of my colleagues and co-workers here at the University of California, San Diego are of Asian or East Asian extraction. Most of them have advanced degrees and are freaking brilliant. Pick up an IEEE or ACM journal some day and look at the authors of the papers, some day. Without them, most of our labs would dry up and blow away. Their language skills may leave something to be desired but I don't speak Mandarin or Urdu all that well, myself, so they're a couple of notches on the accomplishment scale there, too. If someone were to post some malicious 'codes' in response, how many of them would just paste it in and run it? The Beast » « Announcement: A New, New, New Name!